Artist Billie Eilish‘s collaborative video with Takashi Murakami “you should see me in a crown” now has official merch available for sale. The duo’s collection has been designed by Chicago’s Don C for a trifecta of music, art and fashion. The items include a graphic tee and hoodie, both available exclusively in black. The tee utilizes Murakami’s ubiquitous Flowers design growing out of a “Frisk”-esque speed logo that spells the artists name in purple. The hoodie is simpler, with only the font on the front but a modified blōhsh figure on the back — a partnership of design between Billie and Takashi. Don C’s rainbow ‘Just Don’ signature is found adorning both piece’s rear neck for a finishing touch. 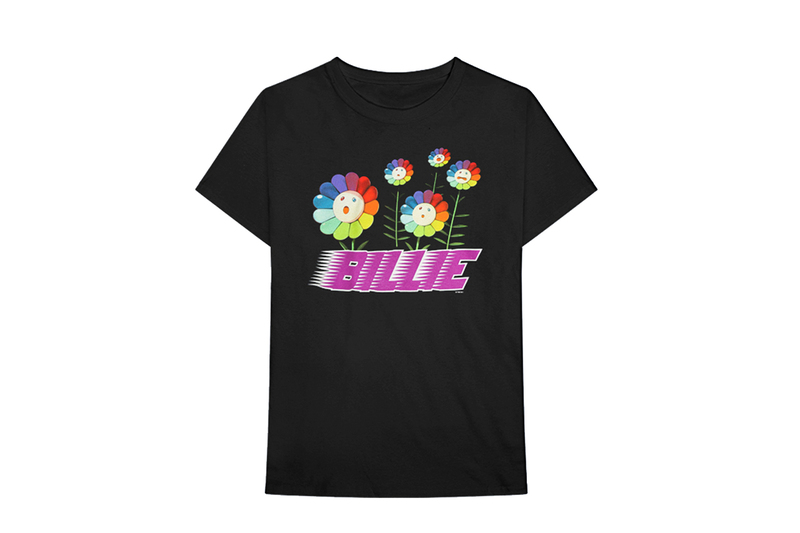 The Takashi Murakami x Billie Eilish “meadow” black tee is available for $50 USD, while the black “blōhsh” hoodie is priced at $100 USD. Cop both over at Apple Music’s webshop, set for a 3-4 week delivery window via pre-order. “you should see me in a crown” video by @takashipom OUT NOW only on @applemusic. Murakami also collaborated with Cherry Fukuoka for a limited capsule collection between the two Japanese entities.